Designed as a successor to the Pz.Kpfw. 38 (t) and Pz.Kpfw. 38 (t) n.A. designs, the Skoda T-25 has a similar profile. It's larger, with sloped armor, and has a forward rather than center mounted turret. For its tier, the armor is sub-par, but still decent - though against heavies it will not last very long. The T-25 makes up for it by being very fast with a 60km/h top speed and can be achieved by its rather powerful engine, making the tank very good at breaching enemy lines, or moving from supporting one position to another in a hurry. However, it very much lacks in maneuverability. Don't expect to dodge shells like a light tank as it has a long chassis. 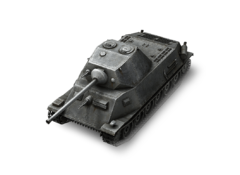 The T-25 has an excellent rate of fire with the 7.5 cm A18 KwK, which is comparable to the 7.5 cm KwK 40 L/48. It is quite accurate and with its high rate of fire, the T-25 is capable of devastating lower tier tanks very quickly, but it is has trouble against stronger tanks' front armor. Overall, it's a decent medium tank. While it cannot stand up against heavies such as the Pz.Kpfw. VI Tiger, it is still a valuable addition to any player's arsenal. Rather low view range - can be remedied through tactical use of Binoculars. The T-25 combines great speed and accuracy into one full package. Compared to other tier 5 tanks, the T-25 looks about average on paper, but is very different on the battlefield. It can achieve a surprisingly fast top speed, and has a very high amount of hit points for its tier. The gun has the nearly the same penetration as the T-34's 57mm. In terms of accuracy and alpha damage this gun is better than average, but its aim time is a sore point, requiring one to wait to aim and shoot for a rather substantial amount of time, forcing the tank to be still. This tank has very minimal armor so don't expect to bounce any shots bigger than tier 4 shells. A good way to use this tank is as a flanker, while the enemy is focused somewhere else. In a low tier match, it could also play as a brawler, but caution is advised. It can also prove to be an effective sniper tank, but will have a hard time penetrating some tier 6 and 7 tanks at range, but side armor will be an effective target. Being a premium tank, the T-25 has a very good credit earning potential when compared to other tier 5 tanks, but it does not contend in this field with tier 8 premium tanks. The T-25's one big weakness, however, is the tank traverse. The tank will make VERY wide turns, and turning while moving up a hill will be very slow and painful. Circling tanks can be very tricky with the T-25. Even with 100% crew, the tank does not turn like other medium tanks. It has good gun depression, enabling it to use hilly terrain to its advantage. In all, this tank will reward anyone who is familiar to the Panther's (or for that matter, any German medium's) playstyle. An accurate and mobile sniper tank with good DPM but low maneuverability, fighting at range is its greatest asset and done correctly can help win the game. 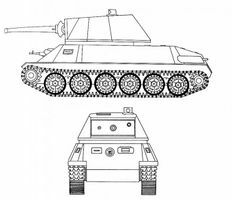 That said, it is very vulnerable to many tanks at short range due to its lack of maneuverability, armor and slow turning turret. To play efficiently, you must keep distance between you and the enemy, using the excellent speed and acceleration to help you run away. Despite its shortcomings, the T-25 is a good premium tank and can adapt to many situations, proving itself time and again against other foes of the same and higher tiers. The T-25 never left the drawing board in 1941, but it was to be fitted with an eight cylinder engine giving it 450 HP and a top speed of 60km/hr. The Main gun was to be a semiautomatic 7.5cm A18 KwK gun with a "drum auto loader." It was Skoda's proposition for the Panther but the Nazi Party rejected the design, because designs by MAN and DB on the "Panther" were too far along. This page was last modified on 26 August 2014, at 18:13.